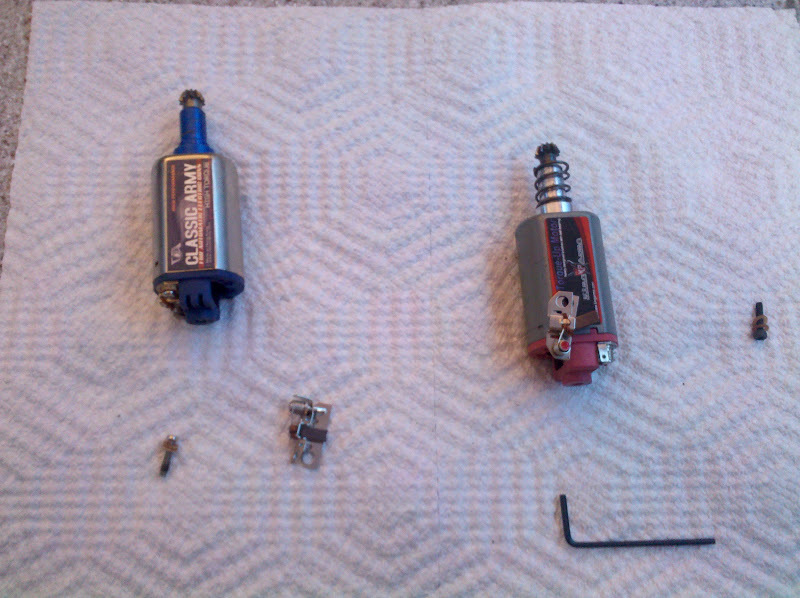 Pyramyd Airsoft Blog: AEG Motor Repair: Replacing a broken motor contact after snapping it off while working on your favorite gun at 4am (in the morning). 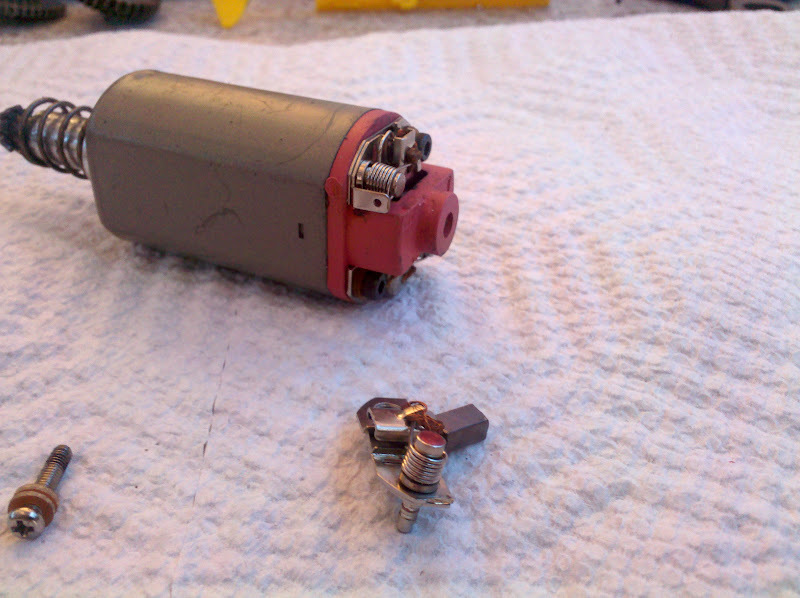 AEG Motor Repair: Replacing a broken motor contact after snapping it off while working on your favorite gun at 4am (in the morning). So, it wasn't like I didn't have enough troubles already with my current project. I am in the process of turning my Classic Army CA25 into a fire-breathing M110 Semi-Automatic Sniper System. The other night (Saturday, I believe), I was in the zone and was cranking away on getting this baby up and running. Well, I ran into a few snag points along the way because I was replacing the stock wiring with some 16 awg, silver-plated Mil-Spec wiring that I get from McMaster-Carr. In the process of doing this, I inadvertantly snapped off one of the motor's spade contacts that slips into the wire terminals. Lesson learned: don't force things that should not need to be forced. If you have to force it, STOP. Do not pass Go. Do NOT collect $200. So now I've got a broken part that I have never seen available in any Airsoft store that I've ever frequented in my life. Luckily, I had been conversing via email with my new bestie, RiotSC, of Siegetek Gears, about the new gears he made me for this project not too long before this happened, so I knew that he was awake despite the early hour of the morning. He suggested what I should have guessed on my own, but at that hour, I was in no condition to be thinking clearly. Just simply swap out the end plate of a spare motor that I might have lying around. Well, of course, I had several spare motors available because I NEVER throw out or sell spare parts for this very reason. Long story short, I thought I'd post up a couple pics to show you just how easy it was to replace the broke contact plate with a fresh one. I took the stock Classic Army motor that came with the CA25, and remove the plate on the positive side, because that was the side that I had broken on the King Arms Infinite Torque Up Motor. I don't know if it matters or not because of the magnets and polarity that may or may not be involved, but I didn't need any additional variables involved that could get screwed up here, so that's what I did. Below, you can see that I've already removed each plate for their respective motor. 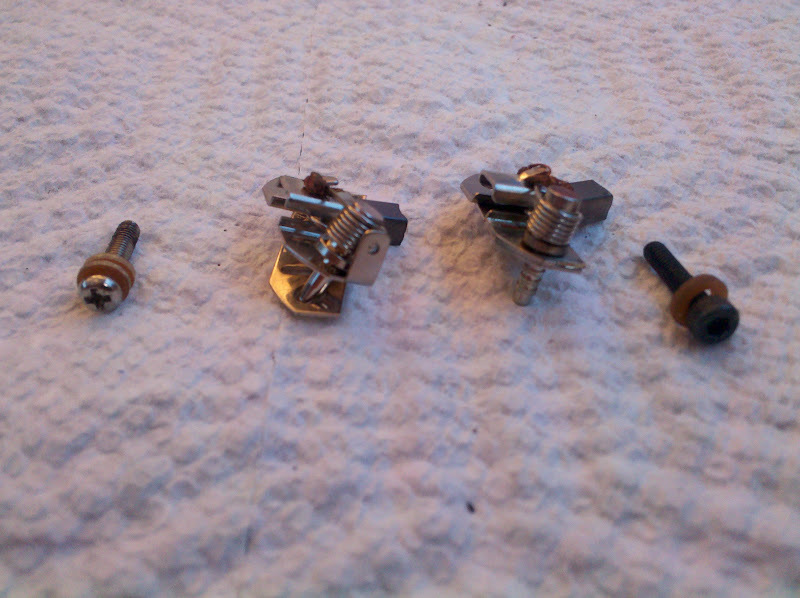 The King Arms IFTU AEG motor on the right is the one that I am repairing. All you need to remove each plate is a small flat-head screwdriver and a small allen wrench like you see pictured on the bottom right. It actually will depend on the motors you are dealing with though. The Classic Army end plate was secured by a small bolt with a Phillips head, while the King Arms end plate was secured by a small hex bolt. You will also need the small, flat-head screwdriver to assist you in popping off the plates. Each plate is anchored into the motor by a guide post that you will see pictured in the next image. Here's a close up image of the two end plates. The one on the right is the broken one, while the one on the left, still has the contact plate in tact, on the end of it, as you can see. Note the guide posts that each of the springs are wrapped around. You don't need any special tools to deal with either posts, they simply help to keep each assembly in place on the motor. They can be pulled or gently pried out of their seat on the bottom of the motor with that little screwdriver I keep mentioning. Viola. The new end plate is now attached and secured to the King Arms IFTU motor and ready for action. The plate with the broken contact is in the foreground, along with the screw from the Classic Army motor. I was able to use the original hex bolt with the Classic Army end plate, so I opted to keep things as much of the same here as I could. If you have any questions or comments, post them here in the comments section. I'll be happy to assist as much as I can.